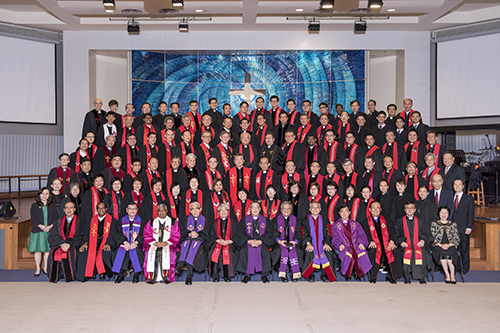 The Rev Dr Chong Chin Chung was consecrated as Bishop of The Methodist Church in Singapore (MCS) for the 11th quadrennium in a glorious, dignified consecration service on 2 Dec 2016, witnessed by regional Methodist bishops who had flown in for this historic occasion. The solemnity of a dedication service steeped in Methodist tradition saw a 1,014-strong congregation, and the presence of distinguished guests including Bishop Dr Ong Hwai Teik of The Methodist Church in Malaysia, Bishop Amat Tumino of Gereja Methodist Indonesia, Bishop Asiri P. Perera of Methodist Church in Sri Lanka, Bishop Dr James Kwang Pek Chuong of Chinese Methodist Church in Australia, Bishop Chen Chien Chung of The Methodist Church in the Republic of China, Taiwan, and the Rev Gao Feng, President of China Christian Council. Beautiful strains of music and soaring voices filled the air at Queenstown Chinese Methodist Church/Faith Methodist Church as Bishop Dr Wee Boon Hup, the Rev Dr Chong, guest Bishops, retired Bishops of the MCS, Annual Conference Presidents, key office-holders carrying banners, and 120 Methodist pastors proceeded to their seats during the processional hymn ‘Joyful, Joyful We Adore Thee’. The exultant, heartfelt music of the Methodist Festival Choir and Chinese Annual Conference (CAC) Combined Choir, accompanied by the Methodist Festival Orchestra and Paya Lebar Chinese Methodist Church Symphony Orchestra, was interspersed throughout the service in hymns and anthems, adding to the jubilant, celebratory atmosphere. 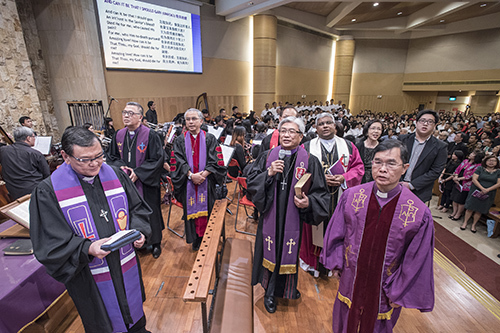 The newly-installed CAC President Dr Gregory Goh Nai Lat, Emmanuel Tamil Annual Conference (ETAC) President James Nagulan and Trinity Annual Conference (TRAC) President Dr Gordon Wong presented the Rev Dr Chong to Presiding Bishop Dr Wee. 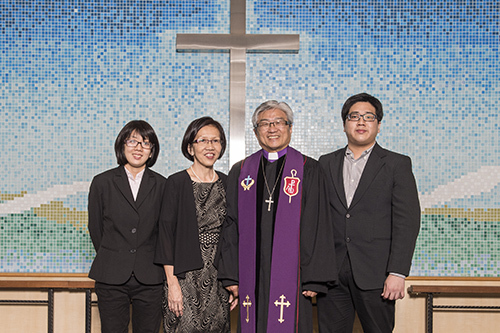 Bishop Dr Wee conducted the Examination, and invited the Rev Dr Chong’s family – his wife Mdm Ng Swee Kuan, and two of his three children – to stand behind him, and the congregation to pray silently for him. Bishop Dr Wee then laid both hands on his head in blessing, joined by participating Methodist bishops. It was a sacred moment, as we prayed for God’s appointed spiritual leader of the MCS for the next quadrennium, and mulled on the heavy responsibilities placed on his shoulders. 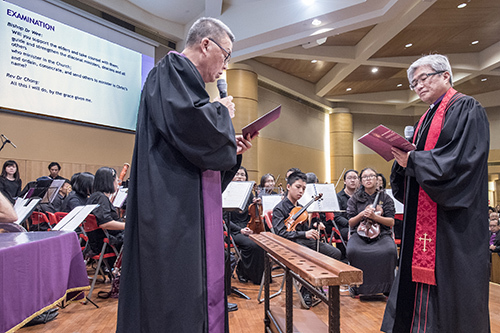 The congregation was invited to rise to sing the Gloria Patri, “as our first act in recognition of our new Bishop, to honour and glorify the Lord our God”. In Joshua 1:1-9, God instructed Joshua to continue with Moses’ mission, and reaffirmed His promise to the Israelites. Joshua had taken over leading a new generation of Israelites, who must remain focused as their mission was to cross the Jordan River into the Promised Land – a new leg in the journey with its own challenges. Joshua had to convince the Israelites to continue with their march, bringing with them the hope of God’s promise and moving onward together. Eventually, Joshua didn’t live to see whether the Israelites became a great nation, or if they became a blessing to the other nations, just as Moses who brought the Israelites out of Egypt did not get to see them enter the promised land of Canaan. Many church fathers and leaders did not get to see the MCS as it is today, but because they gave their all during their time in office, we are able to inherit the past. 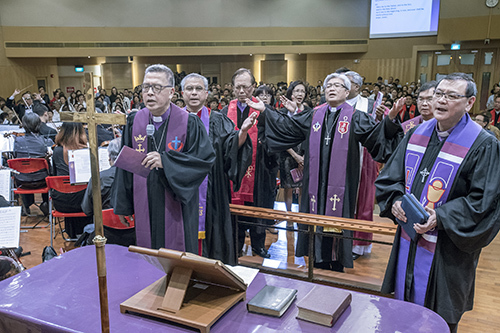 Fittingly, the sermon was followed by the participation of retired bishops of the MCS: Bishop Emeritus Dr Robert Solomon offered the intercessory prayer, and Bishop Emeritus Wong Kiam Thau made the offertory prayer. The offering was collected for the Methodist Welfare Services Chaplaincy Programme. 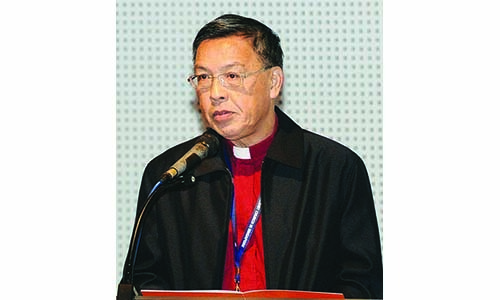 is Editorial Executive at Methodist Message and worships at Foochow Methodist Church. 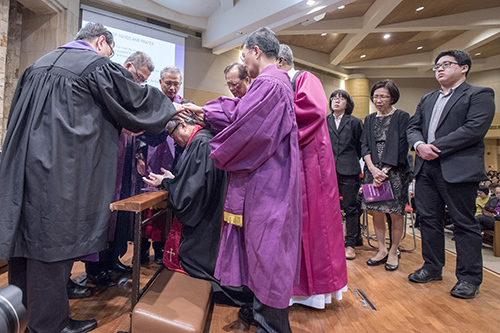 Picture above: Bishop Dr Wee and participating Methodist bishops laying hands on Bishop-Elect Dr Chong’s head in blessing as his family stands behind him. 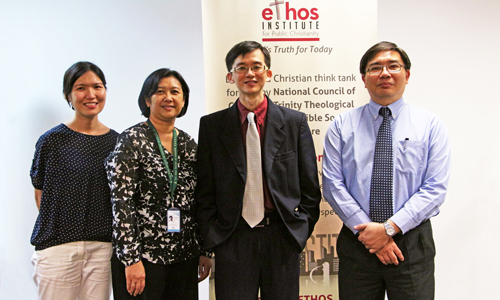 Bishop Dr Wee Boon Hup conducting the Examination for Bishop-Elect Dr Chong Chin Chung. 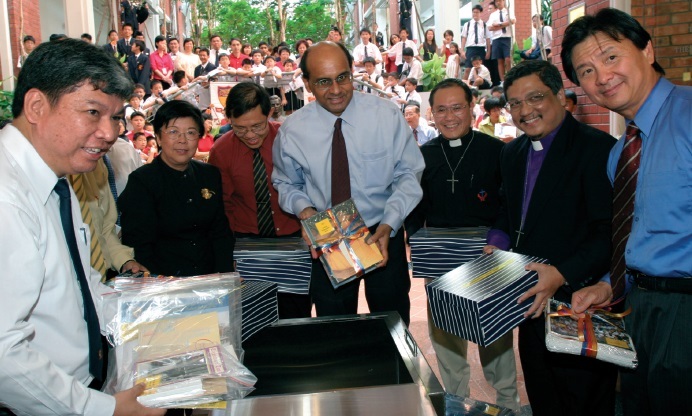 From left, clockwise: Bishop Dr Ong Hwai Teik, Bishop Dr Wee Boon Hup, Bishop Dr James Kwang, Bishop Chen Chien Chung (partially hidden behind Bishop Dr Chong Chin Chung), Bishop Asiri P. Perera, and Bishop Amat Tumino.